The Charleston Ballet will feature renowned artist Tonie Garrett. She stated about her art, “As I endeavor to capture the essence, color and light, (most recently in pastel), it is my hope that viewers will be captivated by the individual characteristic of each image – their uniqueness and energy! Pastel affords me immediate results and satisfaction; the vibrant colors are an extension of the energy which I find coming from nature and from my photographs, sometimes I am so compelled by a scene, I have to paint!” We hope you will stop by and see her. The Art Store will feature “Everything’s Fine,” which has come to Charleston to support the REACH Program through The Counseling Connection. REACH is dedicated to providing professional, compassionate care to survivors of sexual violence. The Clay Center’s Art After Dark will feature pop-up artist Staci Leech-Cornell, button making, and live music. Property Elite will also showcase Staci M. Leech-Cornell, who was born and raised in Greenbrier County and graduated from Marshall University’s Masters of Arts program with an emphasis in sculpture in 2007. Uncork & Create will feature the Charleston Gazette-Mail’s “Sights of Summer” – an exhibit of Kanawha County news photography and front page stories from this summer. Attendees will enjoy a special presentation of the Charleston food scene with Steven “The Food Guy” Keith. RK&K Engineers will be feature Bleu Studios artists David Frazier and Molly Fox. Swiftwater General Store’s featured musician will be Andrew Adkins, and the featured artist will be potter Meghann Ferguson. Aronfield Agency will have karaoke until 7:30followed by improv comedy group “The Mighty Schmucks.” Neil Curry will offer free impromptu guitar lessons; Claire Hemme will sell stickers that she designs; and Aronfield’s photo booth will be taken over by Taste! WV Magazine. Eggs Will Roll will also be set up outside. Romano & Associates will feature “Blue and White: Photographs Printed by the Sun” – a series of sunlight prints of underwater and topside photographs by Eric Douglas. AIA WV Sponsored by Pickering Associates’artist this month is Melony Gingery, who creates sculpture and ink on paper artwork. WV Market Gallery will feature TC Davis of Tower Creations, who hand makes bohemian, beaded jewelry. Each item is carefully crafted with high quality materials. Gallery Eleven’s featured artist is Carol Hillary, with guest artist Scott Milam. Delfine’s Jewelry will host artist Larry Wolfe. 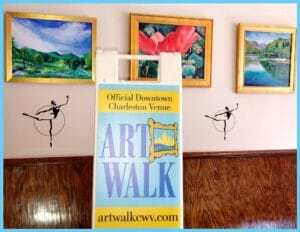 Additional participating venues include: Art Emporium, Tops Off Barbershop & Spa, Independent Order of Odd Fellows Artists, Chet Lowther, Black Sheep Burritos & Brews, Ivor’s, Rock City Cake Co., and Taylor Books.